Apple is supposed to thoroughly revamp its basic iPhone, introducing one with 6.1" LCD display in the fall, at the $650 tag reserved for its bread-and-butter handsets that sell the most. That's quite the jump from the current 4.7" iPhone 8, but the new aspect ratio brought along with a TrueDepth camera notch, should keep the size nice and compact still. 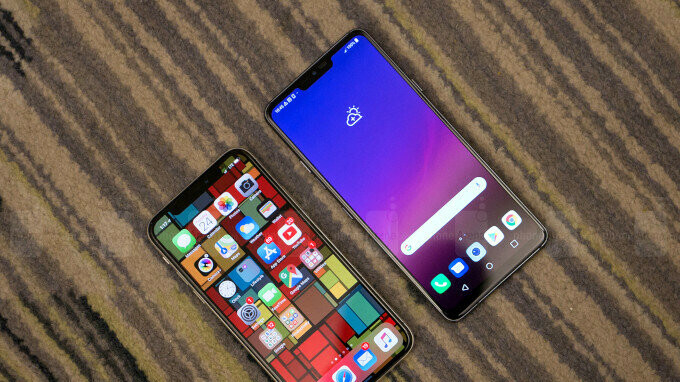 How will Apple do its giant notch on an LCD screen? Well, the iPhone 9, or whatever it's called, is heavily tipped to use JDI's Full Active display technology. While not an OLED screen, it is flexible enough for slight bending, plus the panel bezels and connection circuitry at the bottom are reduced to a minimum, making Full Active screens one of the most compact around. The iPhone 9 will allegedly have one more ace up its display sleeve, though, reports Korean media, and it is technology currently found on LG's newest flagship. Called MLCD+ on the G7, it adds an extra white pixel to the regular red, green and blue dots, so the backlight goes straight through to show white, instead of filtering three colors in an utter waste of resources. This allows MLCD+ panels to be much brighter (up to 1000 nits in the case of the G7), and also consume less energy when displaying white, compared to regular RGB matrices. The iPhone 9 is shaping up to be a pretty interesting gear, and analysts are expecting a windfall for Apple from its sales this year, so we will keep our ears to the ground for any further info on its design and specs. Well, they obviously don't want to work with Samsung anymore, so it looks as though we'll have no choice BUT to rely on LG's screens. It's a good thing if they do, because it's not like LG i's super busy selling their own handsets, which may be the only reason why they'd continued their flagship devices anyway: They're not pushing for profit, they're possibly trying to get the attention of other OEMs for parts integration and manufacturing. It's about saving money. Apple went for an OLED screen just for their anniversary edition smartphone, all reports back then hinted they will go back to LCD screens at least until OLED panels cost almost as much as LCD ones. That's why Sony's most expensive TVs are CrapOLED :D And trust me, you will love this CrapOLED technology once your beloved Sony uses them on their phones..... in 2030. Every year the cost of LCD is reduced, so oled will never costs the same. Most of oled is produced by evaporation which is the most expensive method. Also the least efficient. JDI is Sony, Sharp and other Japanese OEM’s group of companies. XZ2P has this kind of screen but Apple has never been client. If the rumors are true that apple is going to reduce prices it only make since they would not go with OLED. An LCD screen in late 2018 for a device that will have a flagship price tag? Meh, that's simply dissapointing. Do you have a bad case of Tourettes? I really think you should get checked out. IPS LCD for long use way better than Amoled.